Yesterday the Daily Mail published the front page pictured here. To clarify, the first subhead reads: “Man who bred 17 babies by 5 women to milk benefits system is guilty of killing 6 of them”. 1) accuracy: it is not accurate to maintain that Mick Philpott committed this terrible crime because he was on benefits. He did so because he was jealous and greedy to a psychopathic extent. 2) opportunity to reply: the children he killed do not have the opportunity to reply. Neither did they ask to be born to this man. 3) privacy: it is an invasion of the dead children’s privacy to publicise their photographs on the front page, especially with the claim that they were simply “bred” by Philpott. 4) harrassment: this article effectively harrasses genuine claimants of state benefits by positing falsely that Philpott’s crimes were linked to his benefit claims. 5) intrusion into grief or shock: several children were killed by this man. Everyone in the family as well as self-respecting members of the public (especially in the Derby community) would be grieving and appalled at the usage of dead children to score political points. 6) children: these children are dead. They also had siblings now potentially tainted by association. Does that not say enough? 7) reporting of crime: the Code says “Particular regard should be paid to the potentially vulnerable position of children who witness, or are victims of, crime.” Again, no such regard was paid to either the dead children or their surviving siblings for the above reasons. 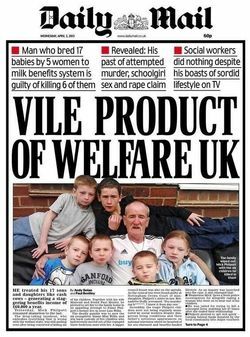 8) discrimination: the article discriminates against Philpott and his family, as well as any other benefit claimants, for being “vile products of welfare UK”. This news story is about a terrible, tragic crime and whilst it is in the interests of the public to know what Philpott did, it is not in its interests to be told that his being on state benefits had anything to do with the killing of the children. I await the PCC’s response to my complaint.